The term ‘healthier’ being relative…these are more healthy than the original recipe. I found this version over at Heavenly Homemaker. Apparently, she took a basic recipe and substituted some healthier ingredients. This version does have a little different taste to it, but it’s good! I enjoy it alone, but I think some vanilla ice cream on top would be really yummy, too! I’ll share the recipe below, including the ‘normal’ ingredients in parentheses, in case you don’t have the healthier stuff on hand or want to go half and half with the healthy. FIVE ingredients is all there are, people! Doesn’t get much easier than that! Stir melted butter and sucanat (or sugar) together. Add eggs and vanilla, mixing well. Stir in flour and mix until well combined. Pour batter into a 9×13 inch baking pan. Bake at 350° for 25 minutes. I did have some sticking with the glass pan I used. There is so much butter in this, it shouldn’t stick…but it did. So you might want to very lightly grease your pan. It’s easy enough to use a knife to release the bars if you don’t want to add additional fat. Also, I have not made the ‘original’ version of these bars and gleaned the substitutions from the comments on the original post. So I believe they are accurate, but I can’t vouch for them personally. *Sucanat: This is a natural sugar cane product that is less processed than basic white sugar. 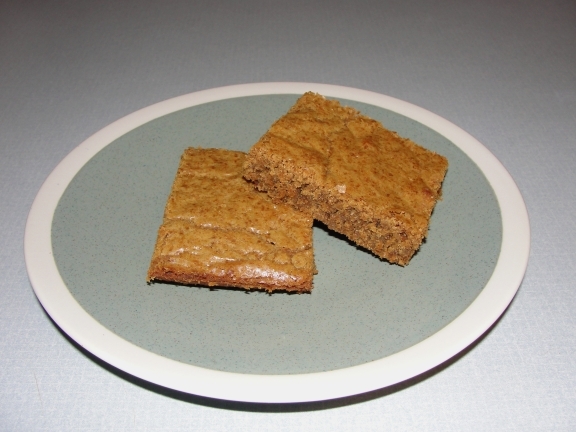 It retains more nutrients and has a bit of a different, almost-but-not-quite brown sugar flavor. It has larger grains and is darker in color than white sugar. I’ve purchased some at Target and through Azure Standard. It’s even available from Amazon.com! They only sell it in bulk right now, but you can at least see what you’re looking for and it seems they might be selling single 1 lb. bags at some point. If anybody makes it, let me know how you like it! Hurray for you!! I hope to see more of these healthier versions of your favorite desserts:) I have made something like this… anything with natural sugar my kids love;) miss you! Hope all is well.